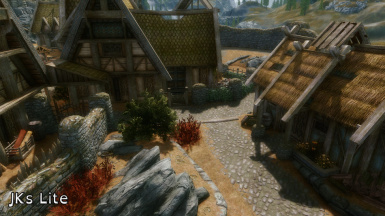 Overhauls the Cities from JKs Skyrim to make them more compatible and much more performance friendly. Comes in two versions for different performance and style needs. Towns on the way next year. All credit goes to Jkrojmal, the creator of the original mods. To be able to edit and distribute these files you must obtain his permission first. If he gives permission you have full permission from me to whatever you want with these files, except publish them to another site. You must also notify me either via PM or in the comments but don't have to wait for my reply. This is a nexusmods.com exclusive mod, I do not give permission for it to be uploaded to any other website, domain name or file sharing resource. Anyone who sees this file on another website has full permission to file a DMCA against it on my behalf, and please notify me of it directly. - Major update to the Towns BETA. Now includes all files. More info on that in the actual Towns Readme. Will be the final BETA before full release. Does not yet include the Skaal village. I still haven't even seen that in game, that will be coming in the full release of it. 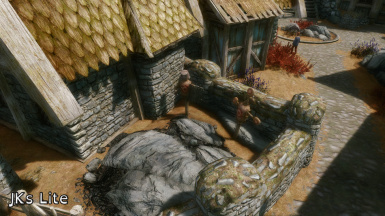 Towns added to the BETA : Rorikstead, Dragon Bridge. Further edits to Towns BETA from previous version : Riverwood (extensive), Dawnstar (touch ups). Moved Carlotta so she is no longer hiding behind some clutter. If the issue persists theres nothing more I can do here, please look for mod conflicts reverting this change. Sorry for the lack of updated Readme/properly formatted changelog. Super tired and not feeling well, just wanted to upload this while I could. 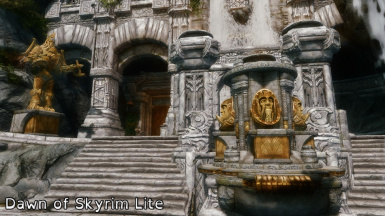 I made a silly mistake and forgot to clean the SuperLite Merged and Markarth files before uploading. This update removes the two UDRs in it. Very sorry for the mistake guys. Make sure you also check the 1.2.2 changelog if you didn't already. 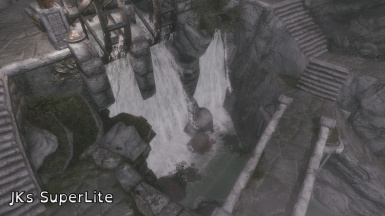 Small update to fix 2 UDRs and an ITM in SuperLite Markarth and SuperLite Merged that I forgot to clean out after some last minute editing. Make sure you also read the 1.2 Changelog in the changelog tab. All of the individual cities are now actually cut out of the main MERGED files, rather then me merging the cities into a single file with each edition. 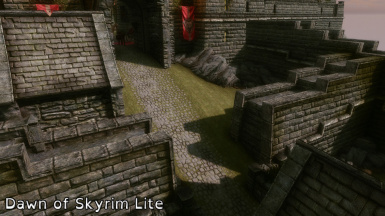 This keeps all the FormIDs and references the same, allowing people to make compatibility patches for the mod, just make a file for the main MERGED version of Lite or SuperLite, and then cut out the cities in tes5edit you don't want/need. This process will be kept the same from now on. 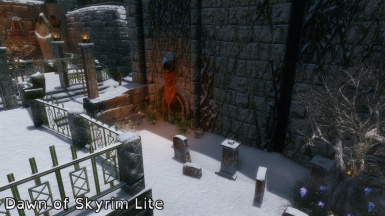 Added DAWN OF SKYRIM LITE version to the installer. 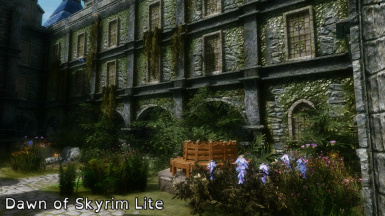 Keeps all of the compatibility edits to the main Dawn of Skyrim version in the installer because also strips out a lot of flora, banners and other clutter to improve performance in all the cities when using them together. Detailed changelog can be found inside the readme in its specific section. - Changed blacksmith railings with the ones from Dawn of Skyrim which look a lot nicer. - Added an edited DawnOfSkyrim-AllMajorCities.esp that contains all compatibility edits. Follow instructions in the readme to remove any cities you don't want. Thank you to BlueTwoPiano who allowed me to do this, it is VERY much appreciated. - No longer offering specific merge for Dawn of Skyrim full users. Use the edited version instead. - Carried over USLEEP edits for DLC compatibility. Inital mod release. All info can be found in the description or the readme. JKs Skyrim has absolutely amazing style, however the performance hit needed to maintain that look for a lot of people was unsustainable. After seeing a lot of comments about people on weaker rigs dealing with a huge performance hit simply because they liked one or two aspects of the mod, and people on potatoes talking about how desperately they wanted it, I decided to jump in and make some alternate versions for those who may need it, including myself as my own computer didn't do too well with the full versions either. 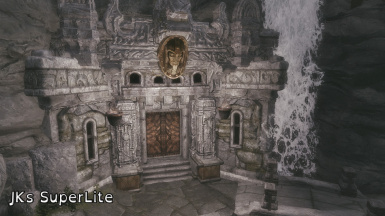 LITE - Retains all of the style and additional function of the original mod, but strips back a lot of decorations or repeated objects. Has half the performance hit of the original mod. SuperLITE - Strips back the decorative features even more, leaving only the most recognizable and core additions to the mod. Has a quarter of the performance hit from the original mod. 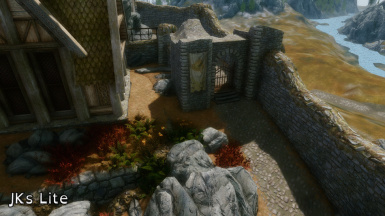 Both versions come with NO vanilla navmesh editing (see the FAQ about the presence of an additional navmesh in Windhelm) and increased compatibility with various mods including a specialized version of Dawn of Skyrim which is available for download with the installer. This mod is not a patch for the original, it is a replacement for the cities only, so any compatibility issues around the JKs Towns modules are not fixed. A detailed list of all edits made can be found in the ReadMe (please view as .txt for best formatting). There are no requirements to this file other then a legal copy of Skyrim.esm and Update.esm. Just install with either NMM or MO and follow the instructions in the installer. Inside the installer you have three options. A merged file for the Lite version of all the cities has been provided, and a merged file of all of the Superlite cities has been provided. Alternatively you can pick to do a custom installation and pick whatever cities you want, and whatever versions you want, however please note that you should NOT run the Lite and SuperLite version of a single city together. A Dawn of Skyrim edited file is now included in the installer. 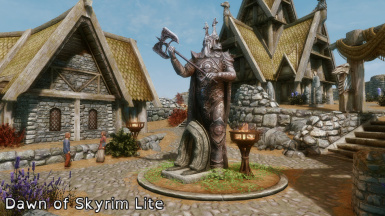 To use this file you must download the original version from the Dawn of Skyrim Collection page, and then install JKs Lite over the top as I have not included the assets (.bsa file) in this download. It is an edited version of the entire collection and as such it contains all cities in one. 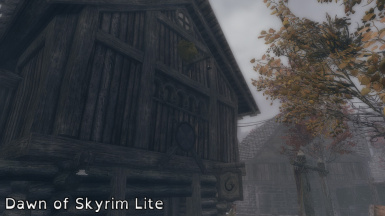 If you wish to use my edits but don't want all of the cities from Dawn of Skyrim, simply open the file in Tes5Edit, wait for it to load, open the Worldspaces category, and right click and hit remove on whatever city you don't want, quit and save. This is very safe and will not harm your game. 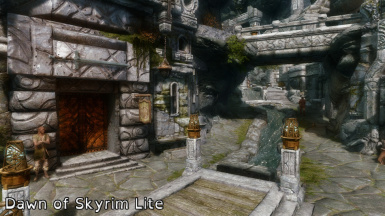 An alternative Lite version of Dawn of Skyrim is also included as an option, that removes a lot of miscellaneous clutter such as banners and flags that were hung everywhere, for even more visual and style cohesion between the mods and improved performance for those wishing to use both mods together on weaker rigs. The same as above, you require the bsa file from the original mod page to be able to use this file. with the Tes5Edit Merge Plugins 1.9 script. Please Note: FPS Values are affected by multiple factors. While I was standing in the place that caused as much as possible of the city to load in each instance, as marked below, some cities had more open viewing spots while others did not , portraying less dramatic values. 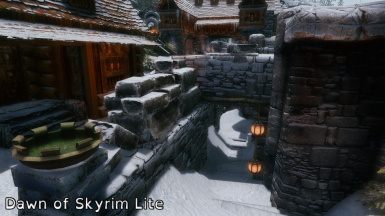 Windhelm in particular shows this as it as better optimizations due to the amount of walls and buildings that break line of sight. These values are also from static tests and do not account for stuttering that may appear when moving. Doing your own tests while running around each city is advised to get the most accurate information for the performance improvement on your particular setup. 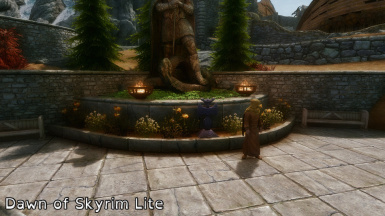 Dawn of Skyrim - Use the provided edited or LITE file included in the Installer preferably. This resolves all conflicts between the two mods and does not require any special placement in your load order. If not, look below for the various incompatibilities. The information as listed below for the individual cities of Dawn of Skyrim also apply to the merged Dawn of Skyrim version available on the Nexus which is all of the full versions, and any of the individual modules. I have them separated like this in the description purely for readability. - Dawn of Whiterun - Fully compatible. 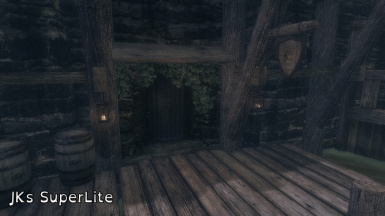 One minor issue with a workbench blocking the new skyforge stairs that can be fixed in Tes5Edit or in game. 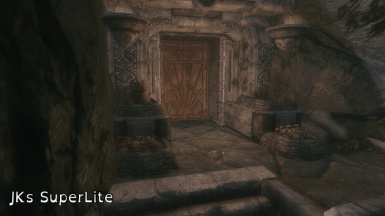 - Dawn of Markarth - JKs Compatible version is NOT compatible with JKs Lite or SuperLite. You will end up with floating merchants if you use that version. - Dawn of Riften - Fully compatible. Dawn of Riften adds a lot of lights around, meaning there will be some duplicates with ones from JKs. 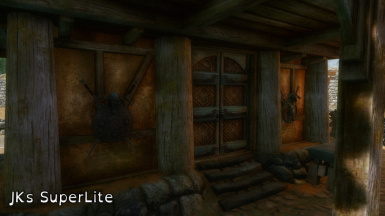 - Dawn of Solitude - Full version is NOT compatible with JKs Lite module. Use JKs SuperLite or Dawn of Solitude's JK Compatibility file if not using the version of Dawn of Skyrim included in the installer. 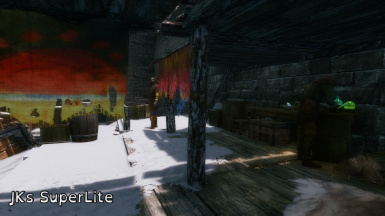 - Dawn of Windhelm - I recommend using JKs Lite or SuperLite instead of the Dawn of Windhelm compatible version of the original mod, as I have resolved several mod conflicts and clipping objects and you will have better visual and technical performance. Must be loaded BEFORE JKs Lite or SuperLite in your load order. Failure to do so will result in some barrels blocking the ladder that lets you up onto the slums on the roof of the grey quarter. Snowy Windhelm - Use the JKs version as normal. If also running Dawn of Skyrim, use the Dawn of/JKs version as the Dawn of Skyrim only version results in a snow drift in one of the refugees homes. Enhanced Skyrim Factions - The Companions Guild - Because the stairs near the Skyforge aren't navmeshed, when brawling with other companions your opponents will no longer endlessly run up and down the new shortcut to the Skyforge. This is a fix over the original mod. Open Cities - Not compatible. I don't have the rig to run Open Cities and test it so I won't be making a patch. I'm happy for someone in the community to make a patch and I will upload it here or if they can get permission from JK they can upload it to a separate page. Notice Boards - Compatible. All noticeboards are still clearly visible and accessible. Enhanced Lights and FX (ELFX) - All of the main modules and the Enhancer module are compatible, but the Exterior module should not be used with any city overhauls, this included, as it is set up for a vanilla city and as such can include some weird placements of lights that clip or cause lighting bugs. On the matter of Immersive Citizens - I have been blocked from the ICAIO page by the author as of March 2016. No reason was given for why I was blocked, all three messages I sent to Shurah have been read or even opened by him, and he has given no public reason for blocking me and several other people on mass after demanding that the ETaC author take down the patch they made for ICAIO. I woke up to being blocked out of the blue and I had not spoken to him in months at the time of being blocked. Even though we have had our conflicts, I'd hoped we had solved them and had publicly offered to help him maintain his articles and description with helping with his english and help him to also handle patching. As a result I cannot get the newest files so I cannot see what any future edits are being done to this mod and am unable to keep compatibility up to date. The only conflict you will find between these files at this stage is NPC markers from ICAIO potentially being covered by objects from this mod. This is not a gamebreaking conflict, nor will it cause crashes, nor will it cause persistent bugs. The worst you would ever get is occasionally an NPC walking into an object for a while. 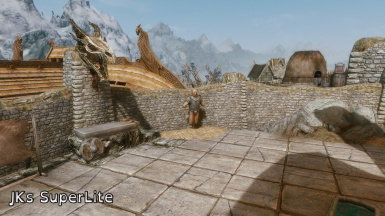 - JKs Lite should be fully compatible with ICAIO, the only issue you will see is that Aela will shoot at the wall instead of the archery target in Whiterun because I couldn't figure out how to undo the aiming edit ICAIO introduces. That is the ONLY known bug. - There are NO known or detectable bugs or conflicts with the SuperLite version of JKs and ICAIO together. - JKs Lite Towns will likely never be compatible due to the above block from the mod page limiting my ability to get the latest version of the file. If I can get the file by fixing things with the author (once I know what I'm meant to try and fix), I will work on this. That will display NPC markers in game for you to see without having to use the Creation Kit for them. If you see any clipping, simply select the offending object with the console and use the 'disable' command (without quotes). If there are any large structures causing problems, I will be unable to fix this as Shurah refuses to allow anyone to make any sort of patch that edits data from his mod. There are no navmesh or other conflicts with this mod that have ever been identified by myself, two other respected authors from the community, and any information about any further conflict has never been provided by Shurah. I have seen no technical evidence to make me believe that there is, or will ever be any other possible conflict between these files. Here's a list of the questions I've been asked most repeatedly, or am expecting to be asked a lot. If you have a question about something that isn't covered here, please feel free to go to the comments and type away. I only count the five main cities. What happened to the rest of the JKs Skyrim Plugins? The core focus for this release was getting out the most used files that were the easiest to patch. I also always run the cities modules, while I swap between JKs and ETaC for the towns so I'm less familiar with the towns. This also means I could focus a lot more on compatibility and on getting the styling right first thing, as well as learning the CK as this was my first project in the CK instead of Tes5Edit. The towns also have a lot more going on, not only are they in the main worldspace which means a lot more affects them, but more extensive edits were made to some of the areas and some of the compatibility edits are a lot harder to implement. A towns BETA is now avalible in the installer which you can use if you wish. This does not cover all the towns, nor are the edits all finalized. 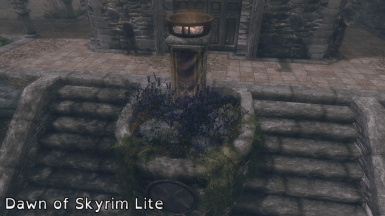 What happened to the solitude gardens? Doesn't JK's Solitude add to them? Yes it does, and while originally I was going to do a whole big overhaul of the gardens as well, I realized that what I had planned was outside of the scope of this project, which was simply to make a performance light and compatibility happy version of the city mods. The Solitude gardens I had planned will be released a standalone on its own page, if I ever get it done, as it will be a garden design unique to me, rather than taken from JK's mods. 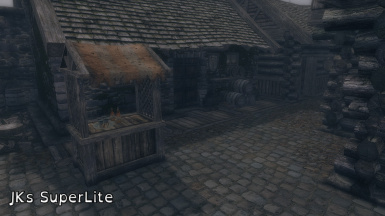 Why do the NPCs occasionally stand still when walking up the ramp in Solitude near the market? It's to do with the weird way that NPCs navigate that particular path. If you look in the vanilla game they actually cut the corner of the ramp, which they can't do any more because I put a gate there. So now they go too far to the left and hit that weird bump on the wall mesh which causes them to stand in place for a second until they figure out a way around it. I have already made the gate and arch almost twice as big to minimize this as much as possible, but it may still happen every now and again. I may see if I can fix the bump in the mesh and release it as a fix in the future. I thought you said this had no navmesh edits. Why does Windhelm have references to the navmesh in its esp? 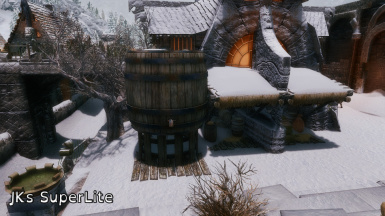 Windhelm has references to a new navmesh, not the existing vanilla ones. I had three options here. One was to strip out all of the dark elf slums that JK added completely so that navmeshing could be completely avoided. The second was to leave all the objects there but not have any NPCs which would have made it look rather pointless. The last is what I picked, which is I copied over a very small part of the navmesh as an island and put it on the slums in the top which allows the two NPCs up there to navigate without allowing any vanilla NPCs to be affected by having extra areas available, hopefully maintaining full compatibility. None of the Vanilla navmesh was affected by these records. Will do you this very specific combination of merged files for me? No. All of these merges were done with the Tes5Edit Merge Plugins script and it takes two seconds. I can't possibly do every set of merges and include them in my installer because that's just too much work to update it all the time. If you would like certain versions merged with certain other versions, these plugins are completely safe to merge together and can even be merged with other city edit mods. The reason I have a few different options in my installer are either because they are logical options to have or they are merges I was going to use myself anyway. Why do some of the cities look like they have been edited more than others? This is just the way that JKs Skyrim was originally edited. 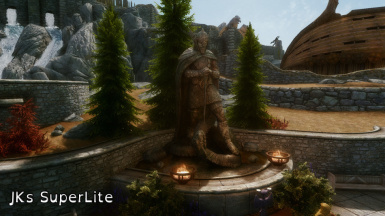 Certain cities had more widespread editing, such as Whiterun which had a lot of little edits across the whole city, while others had more focused edits to specific areas, like Solitude which mainly focused on the new tower. When I carried over these changes I tried to pay attention to what was most important to carry over the style, and as such sometimes the edits are a lot more focused then in the originals. 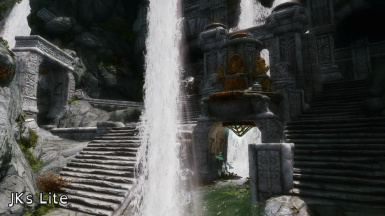 There's a waterwheel missing in Markarth but I can still see the particles where it should be? This is not caused by this mod, it is a problem with Enhanced Wetness and Puddles with a bad edit in that mod. Open the mod in Tes5Edit and remove FormID 00089123 from the file by deleting its entry in the left pane of the program, close and save. Thank you to BlueTwoPiano who gave permission for me to edit Dawn of Skyrim and include it in this file as well, its a huge help. Thanks to elr0y7 who provided some invaluable help in detecting incompatibilities. Thanks to all the people at /r/Skyrimmods that supported me while making this edit, encouraged me and also supplied a LOT of really helpful information, advice or suggestions! The website gifmaker.me also gets a lot of credit and thanks for letting me make the very helpful gifs in the images section VERY easily and quickly, which is the only reason why I was able to do them. The resizer also comes in handy.